Here’s a shot of the newly shaped fork. 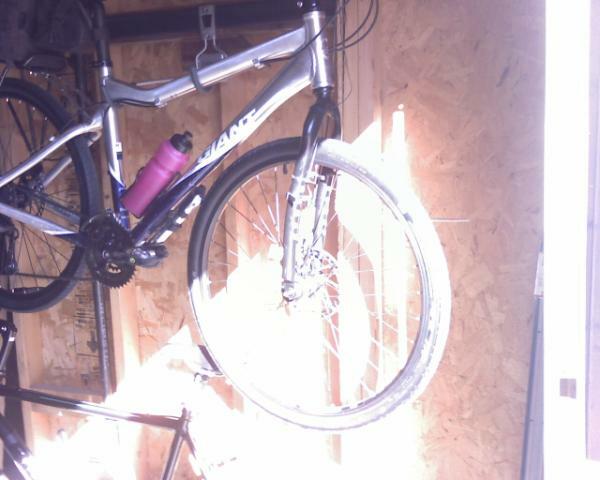 For those of you unfamiliar with bike geometry…it AIN’T supposed to look like this!!! Had a rather interesting commute to and from work on Sunday. Actually, it was the return ride which was most interesting; at least the finale. Left for work at about 8:00 am, riding in beautiful sunny weather. Made it in just over half-an-hour; seven miles at 13.8 mph. Not a record for me but not too bad. Didn’t have a lot of hecklers, just one buzz-by and only a couple of honkers. Really, not too bad, and I got to work fairly well energized. I worked four hours, then looked at some shoes and headed for home at about ten to three. The ride home was not nearly as pleasant as the morning ride. I had 8-10 buzz-bys; at least half-a-dozen honkers; six or eight yellers, and a couple of one finger salutes; which I returned quite cheerfully, as has become my habit. Then, about a mile from home, I saw Andi and Darryl heading in the opposite direction, obviously looking for me. She yelled that they would see me at home; I waved, and kept turning the cranks, only to be stopped at a signaled intersection. Taking off, I saw Andi’s Explorer get out ahead of me so I dropped my head and began churning the last 3/4 of a mile uphill. It’s not a steep incline but, after the four usual climbs along my route, it tends to be a challenge on the way home from work. So there I am, head down, working hard, churning the cranks in the bike lane, when…I lift my head to check my route and…BAM…I slammed into the back of Andi’s SUV. Yeah–I hit a parked car!!! Wow, what a surprise. She had pulled over to pick me up and I never even saw her ’til the last second. My front tire slammed into the bumper and my head smacked the rear window. Doh!!! I’m OK, and so is my helmet, but the fork has been bent back by about three inches. It’s wrecked!!! It’s a Surly 1×1 rigid fork, one of the strongest steel forks on the market and…it…is…DONE FOR. Frankly, I’m shocked at how badly bent the thing is. Anyway, Andi was beside herself, so I figure I have at least a week that I can milk this thing. Growing up as an air Force kid, she understands guilt, so I can guilt the heck out of her for the next week, at least!!! Hey, who wouldn’t take advantage, right? Well, I guess I’ll try to see if I can actually ride that extra-large Nishiki I picked up at the garage sale the other day. Of course, Andi has offered to drive me to work and pick me up after for the next 47 years, but I like riding to work so we’ll see. My neck is beginning to stiffen a bit so riding might be problematic for a few days but, we’ll be ordering a replacement fork tomorrow so I’m sure I’ll be back at it next week. A word of advice to anyone trying to help out a cyclist; thanks for the help but–please–don’t park in the bike lane!!! I have been planning to do some research and analysis which would allow me to write a post on the benefits of bicycle commuting; health benefits, cost/benefit analysis, etc. However, today my Google alerts sent me a link to this article in which that work has been done for me. Always willing to save myself some time and effort, I’m more than happy to share, and give credit where credit is due. Though the article is not very long, it seems fairly comprehensive to me, and is quite well written, without technical jargon or dry academic prose. Thank you Mr. Dorn, for posting this valuable information. People might start commuting by bicycle to improve their fitness, save money or support sustainability, but they continue because it’s fun. Ask a motorist about their commute and they’ll frown, at best. Ask a bicyclist about their commute and they’ll smile, and likely mention the endorphin rush, fresh air, wildlife spotted that morning, the new breakfast shop discovered en route or how their retirement accounts are swelling with money saved by not driving. The health benefits of bicycling are recognized around the world. Cycling is a holistic form of exercise that gradually builds strength and muscle tone with little risk of over-exercise or strain, according to AdultBicycling.com. Legs, thighs, hips and buttocks all benefit, including hip and knee joints. The average cyclist burns about 300 calories during a 20-minute commute, while also improving coordination. Commuting bicyclists easily meet the Centers for Disease Control and Prevention’s recommendation that adults engage in moderate-intensity physical activities for 30 minutes or more at least five days a week. A study in the Scandinavian Journal of Medicine & Science in Sports concluded that just 30 minutes of bicycle commuting improved aerobic fitness, cardiovascular load, cholesterol and the burning of fats for energy. According to the British Medical Association, in a nine-year study of 9,000 UK civil servants, those who cycled 25 miles a week (2.5 miles each way) experienced half the heart attacks as those who shunned physical exercise. A long-term Copenhagen Heart study of more than 30,000 men and women found that even after adjusting for other risk factors, those who biked to work had a 39 percent lower mortality rate than those who did not. A less stressful commute also contributes to mental well-being, even to the point of countering depression. A study at Duke University found that 60 percent of people suffering from depression overcame it by exercising for 30 minutes three times a week without antidepressant medication, which is comparable to the rate of relief people generally achieve through medication alone. Daily exercise may also help prevent memory loss, according to several recent studies from the United States and Europe. The research, reported by the University of Illinois at Urbana-Champaign and others, suggests that because regular aerobic exercise—such as bicycling, swimming or running—can improve cardiorespiratory fitness by up to 14 percent, it helps improve brain function. Further, improved overall health helps prevent certain diseases that may affect mental health. When it comes to sustainability, the bicycle is one of the most energy-efficient personal transportation devices ever created. According to the American Automobile Association, the average annual cost of operating a sedan for 15,000 miles in 2010 totals $8,487; for an SUV, it’s $11,085. Vehicle costs include depreciation, finance charges, fuel, maintenance, tires, tolls, insurance and taxes. Given the latest U.S. median annual household income of $52,029 reported by the Census Bureau in 2008, the cost of car ownership exceeds 15 or 20 percent of the typical household’s income. A quality bicycle, which can be purchased for the price of about one car payment, will never need fueling, is inexpensive to repair and has an operating carbon footprint that’s next to nil. Bicycle commuting is surprisingly time-efficient, too. Federal Highway Administration statistics show that nearly half of all trips in this country are three miles or less. More than a quarter of all trips are less than a mile. A three-mile trip by bicycle takes about 20 minutes; in a busy city, traveling the same distance by car can take longer. Add in getting a car out of a parking space, into traffic, through lights and congestion and parked again, and for many urban and neighborhood trips, bicycles are simply faster from point to point. Making a good thing even better, bicycle commuting saves time that would otherwise be spent at a gas station, car wash, automobile mechanic, department of motor vehicles and even traffic court. Plus, without the large cost of operating a car, it’s just possible that bicyclists might even save the necessity of time spent at a second job. As yet another bonus, there’s next to no time spent sitting in traffic. Returning on the homeward leg of a 15 mile ride today, I happened to notice ANOTHER “Garage Sale” sign, perhaps the 432nd of the day. 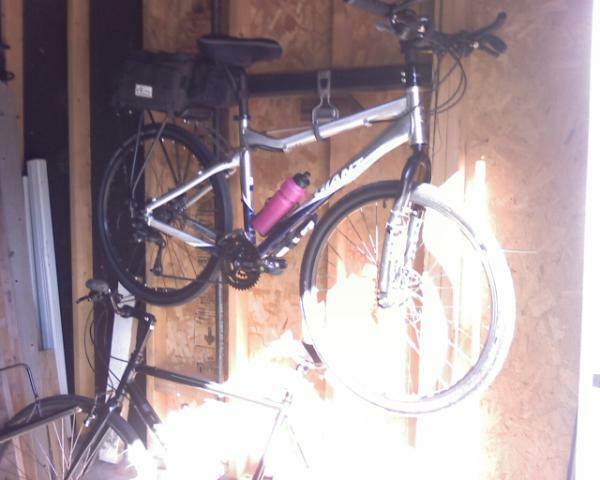 For some reason, some reason like my inability to breathe, I decided to turn off my route and pedal slowly by the sale. 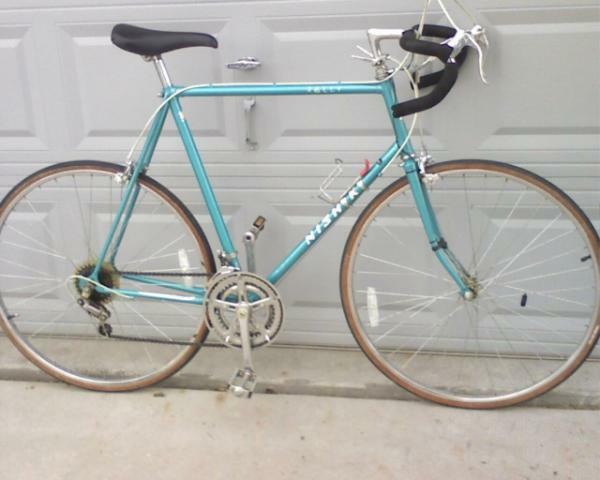 And what to my wandering eye should appear, but this: a lugged steel frame Nishiki ten speed bike, in rather nice condition for a 1980’s vintage, and for which these kind folks were asking 20 bucks. TWENTY BUCKS!!! Suddenly able to breath just fine, I hopped on the old two-wheel machine and began churning the cranks, heading for home and some motorized transport. Twenty minutes later Andi and I were gloating all the way home, amazed at the great deal I had found. These bikes are going for at least $100 all over the internet. With just a little work I can probably get $150. Andi has already secured a domain name for me and my new bike business, which I apparently began today. Always thinkin’, that girl is, always thinkin’. For now the name is a secret, until we see if it’s viable, but I’ll let you know how it goes. For now, I’m just feelin’ lucky. It seems there are other things to do outdoors rather than cycling, as my old high school friend Neil and his family are proving on their vacation. Take a look at his blog, on which he details their trip to Moab, Utah if you don’t believe me. Moab is a cycling mecca, mostly for mountain bikers, yet they’ve found many other ways to enjoy this strangely named area. Neil’s blog is very well done and he is quite an articulate writer. I love to ride in the morning; when my legs and attitude tend to be strong; when the air is cool, not cold; when the sun is behind me, lighting my way. I’m usually on the big chain ring, using the highest gears, while clicking my way up and down the rear cassette as I negotiate the hilly roads here, in the suburbs, east of Denver. In the afternoon or evening however, after a long day of work, most often I’ll be using the middle ring, or even the “granny gear,” as I return home, my legs feeling like packaged meat instead of live muscle. They feel stiff and heavy, and they resist all efforts to churn. I talk to them, “Come on legs, you’re stronger than this,” I tell them. “Don’t be such wimps,” I mentally shout. But they refuse to listen, causing me to “drop” a chainring (or two). Is it just my age? I’ll be 55 next month. Is it improper fueling? I try to eat protein and carbs. Is it the smoking? I’ve cut way back. Is it that, when I’m feeling strong, I push too hard heading out and use all my energy so there is nothing left for the return? I try to be conscious of this tendency so that my legs won’t “bonk” on the way home. Or is it just that I’m a morning rider? I’ve always risen early, at least as an adult, so maybe that’s it. Maybe I’m just a morning rider and I simply must accept this, knowing in advance that the ride home will always be more difficult than the ride out. In Phoenix, when I had a shorter commute of only five miles, I would ride to work, drop my gear for the day, then head out for another 10, 15, or 20 miles of riding. On the way home though, I rarely rode any extra miles. I just wanted to get home to dinner and watch some mindless TV. The riding there was much flatter though, so I had little climbing to do. The route to work and back here has four climbs which are really tough after a long day on the sales floor. I realize that having been out of work for eleven months has had an effect on me. I’m not in working shape yet. Being on my feet all day will take some getting used to. But, I thought my legs were in pretty good shape, so I’m a bit surprised by this struggling to get home after work. I guess I’m using different muscles as I run around the store. I know I’m adding a bit of stress to my life as well, as I try to learn everything in days rather than being patient and allowing myself the weeks required to learn all I need to learn. I’m sure it will get better. However, right now, it’s all very frustrating. I enjoy riding so much, I don’t want anything, not even my new job, to detract from that. Perhaps it’s all just a state of mind. Guess I need to get that muscle in shape too. I’ll let you know how it goes. My first night commute did not take place because Andi wouldn’t let me ride home from work at 9:30 tonight. She and Darryl drove over to get me. She doesn’t think it’s safe for me to ride at night; though I’ve done it 300-400 times in Phoenix. I have lights; a bright LED headlamp that flashes for increased visibility, as well as a red blinker for the rear which can be seen for 1000 feet. I feel just as safe at night as I do in daytime. But my friend wouldn’t let me ride. Could anyone, anywhere, have two more wonderful friends than I have?